And the answer seems pretty obvious: Work hard, give the best service you can, produce the best product possible and treat your customers like Kings and Queens. All true. But if you do it in a vacuum – without ever letting people know what it is that you are so fabulous at – you’ll fairly quickly discover you’re wasting your time. That’s why a good communications strategy – and brilliant PR – is so important. Of course, as PR and communications experts we would say that, wouldn’t we? But before you dismiss us as mere snake oil salesmen trying to convince you that our magic potion is the cure for all known maladies consider the words of an independent expert. And not just any old expert at that. Jo Fairley is a woman who deserves to be listened to and whose views carry real weight. She co-founded global chocolate giant Green & Black’s and has taken the business from a kitchen-sink enterprise in a flat in the Portobello Road to a near £100million worldwide enterprise. 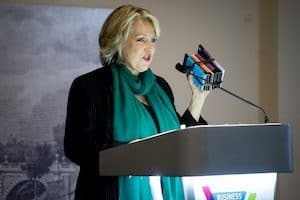 So when Jo told the recent Business Growth and Export Show in Shrewsbury that one of the keys to business success was to invest in PR her message carried real impact. Jo revealed that she hardly ever paid for advertising to spread news about her ethically-responsible and outstandingly delicious chocolate but instead relied on the power of PR – and the influence of journalists and editors – to get her message across. A great PR plan, allied to the most fantastic product and indefatigable energy and passion, turned the brand into the global force it is today. Of course, great PR alone will not turn your business into a global powerhouse overnight, as Jo readily admitted. You need to have a great product, find a real gap in the market and work your socks off to earn success. And, as Jo also advised, the wealth of free advice and expertise offered by organisations such as the Marches Growth Hub – which staged the Shrewsbury show – is invaluable for helping you take opportunities you might not even have been aware of. But if you think PR is a luxury you simply cannot afford, it might be worth bearing her advice in mind and thinking again. Because the right message linked to the right product is a pretty powerful recipe for conquering the world.